Information and pictures on Scabies, a common sexually transmitted disease. Information including symptoms, diagnosis, treatment, transmission, prevention and other general information. 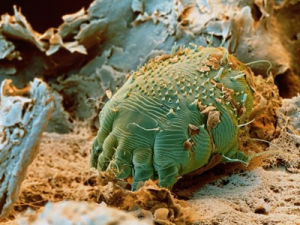 The scabies mite has infested humans for at least 2,500 years. More than 300 million cases of scabies occur worldwide every year. Anyone of any race or age, regardless of personal hygiene can be affected. Scabies is a contagious, itchy skin condition caused by very small, wingless arthropods called the Human Itch mite or Scabies itch mite Sarcoptes scabiei var. hominis (Hering). These tiny arthropods are not insects and have eight legs like spiders. They are just visible to the eye (about 0.4mm) and have round bodies. Attracted to warmth and odor, the female mite is drawn to a new host, making a burrow, laying eggs and producing secretions that cause an allergic reaction. Larvae hatch from the eggs and travel to the skin surface, lying in shallow pockets where they will produce secretions. The female insect burrows into the skin where she lays 1-3 eggs daily. If untreated, the female will continue to lay eggs for about 5 weeks. The eggs hatch and the new mites begin the cycle all over again. An allergic reaction to the mite, its eggs and feces occurs, which irritates and inflames skin. The rash is extremely itchy, which often causes sleeping problems especially in infants and young children. A very small, hard to see, zigzag blister usually marks the trail of the mite as she lays her eggs. a red rash can occur at the area that has been scratched. The itching is due to an allergic reaction to the tiny mites, which is associated with a rash of red, raised spots. Bacterial infection may occur through infected lesions. In many cases, children are treated because of infected skin lesions rather than for the scabies itself. When large areas of the body, hands and feet are scaly and crusted, the disease is called crusted scabies where symptoms are far more severe than usual. These crusts hide thousands of live mites and eggs, making treatment difficult. This type of scabies occurs mostly among the elderly and in AIDS patients. close contact, usually starting at the wrist caused by holding hands with a person who has scabies. Although the mite burrows under the skin the rash and itch are more widespread than just the locations of the mites. The mite or the egg can spread the infection and the mite can survive on objects for a long time, so constant washing of clothing, towels or bedding is necessary. Scabies does not occur because of poor hygiene. Because the scabies rash looks like other itchy conditions, such as eczema, scabies can be difficult to diagnose unless more than one family member also has an itchy rash. The most common test involves the suspected area being mixed with sterile mineral oil and the scrapings viewed under a microscope to detect scabies mites, eggs and/or feces. An ink test is where a blue or black felt-tipped pen is applied to the suspected areas. After the skin is cleaned mite burrows can be located if the ink sinks into them. Prompt action is required as scabies is very hard to eradicate once infected. Currently three main types of solutions are used for scabies. All are applied to the whole body except the head and neck, and all whole family should be treated. is safe for use on the head and neck of children less than two years old. If using a prescribed (poison) lotion, follow the instructions very carefully. A medicated cream such as Elimite (a prescription medication) can be used to treat the infection. keep fingernails cut short and apply mitts or socks to infants’ hands at bedtime to cut down on scratching. Consult a dermatologist before using steroids or any other creams. vacuum rugs and furniture, such as chairs and couches, that the infected person might have been in contact with.